The latest edition of Marc Faber’s latest newsletter fell off two separate trucks in my ‘hood, and I thought the most useful bits were Faber’s observations (honed from many years of seeing the world from Asia) that just because a market has gone down a ton doesn’t mean it can’t go down a great deal further. The S&P 500, adjusted for inflation, is at its highest level ever, save for the 1995-2007 period. By contrast, at the market bottom in 1974, the S&P, adjusted for inflation, was lower than it was in 1906. In 1974, the market cap of all stocks was 31% of GDP versus 100% now, and the Dow yielded 6% and was at a marked discount to book value. The 1974 rally, while powerful, ended in 1976. Stocks resumed their fall and hit their inflation adjusted low in 1982. The Dow chart above makes some of the same points. Faber concedes an equity rally is still possible, which he thinks would lead to a reversal in gold, which he argues would make for a buying opportunity. In general he prefers the risk/reward ratio in commodities to that of stocks. He also recommends selective buying of Asian equities, with the caveat that prices could fall further in 2009. I am far from certain that US equities, which have declined by about 50% from their highs, are such a a bargain. 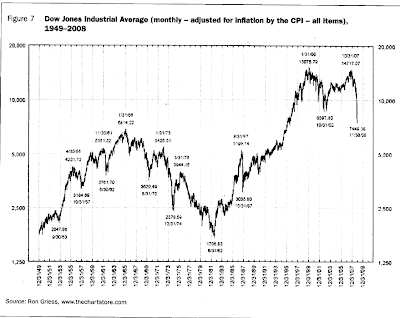 Valuations are far from where they werea at major market lows such as in 1932, 1974, and 1982. Moreover, economic conditions may turn out to be far worse than in previous recessions, including the Great Depression at the beginning of the 1930s. Everybody seems to think that, thanks to the government’s monetary and fiscal interventions, this recession will come nowhere near the 1930s slump. However, I think it might be far worse – and precisely because of the interventions.